I don't know about you but when I think of summer, I think of vacations. I think of long walks on the beach (and if there was a beach anywhere near my house, you would know where to find me). I think of traveling the world. Stuff like backpacking through Europe. Riding elephants in India. Hiking to the highest mountain. Shopping for exotic fruits. Part of the reason why we make bucket lists are to put these kinds of things on it. Will we get to these things? Someday. However, in this new feature, Wanderlust, I want you to have a chance to travel the world without even leaving your couch. This feature will showcase five books set in the country of the post and five places that you could visit within that country (those places may or may not have been mentioned in the books). Books open possibilities for us that we didn't even know possible. I have starved in the desert, walked through Times Square, and visited temples in Japan-- all without leaving the comfort of my own house. 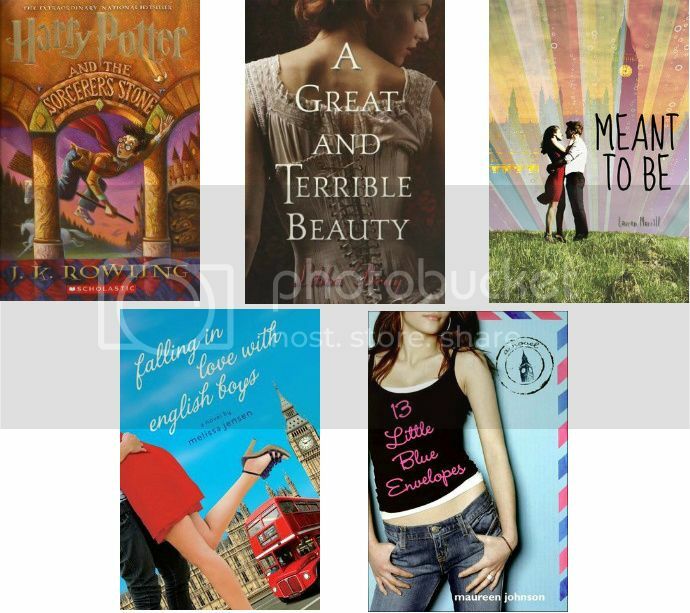 Harry Potter series by J.K. Rowling: Looking to travel to Europe? You can't forget the best-selling series that rocked the world with just a boy and a scar. This book will have you escaping England, into a whole other world meant for wizards and witches. A Great and Terrible Beauty by Libba Bray: Gemma, the protagonist, is brought up in India but swiftly brings readers to the United Kingdom. If you want to travel around historical United Kingdom, catching glimpses of boarding school shenanigans, balls, and gypsies, this is definitely the book for you. 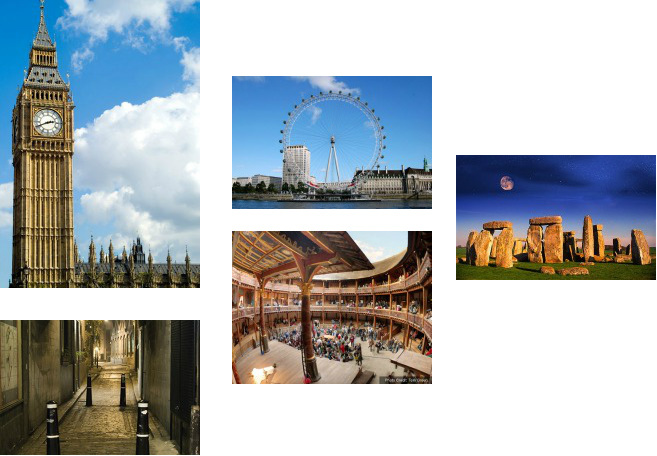 Meant to Be by Lauren Morrill: On a school trip, we travel throughout tourist attractions of the United Kingdom. It is this book that we discover England and I are meant to be. Falling in Love with English Boys by Melissa Jensen: Hello, London. Hello, romance. This one will have you not only falling in love with English boys but with the English setting. 13 Little Blue Envelopes by Maureen Johnson: Following notes around a range of different countries (including the Untied Kingdom), this book will surely satisfy your wanderlust. Big Ben: I just watched the movie, Tomorrowland, and there seems to be a portal to the land of tomorrow in the Eiffle Tower in France. By way of naming famous landmarks among countries, I think many people overlook Big Ben, the gorgeous clock that watches over the city of London. Not me. This is a must-see for anyone going to London. Stonehenge: After taking many classes that have to do with England, I would love to see some of the sights for myself, including Stonehenge. It is the mystery that still lies unanswered. What's the meaning of Stonehenge? Jack the Ripper tour: Your entire vacation can't consist of only romantic and mysterious sights. You have to throw some murder in there to make life interesting. The Globe Theater: A book lovers'-- and Shakespeare lovers'-- wouldn't be complete without visiting where his most famous plays were performed. If you want a magical fairy tale room, there's a butterfly room at the London Zoo. If you want a magical place, think tropical, like the Hawaiian Islands. You will believe anything can happen there while experiencing urban to isolated landscapes all within a very short distance of each other. The colors are vibrant and amazing everywhere you look - with an abundance of waterfalls, seaside cliffs, flora and fauna, and the blues, teals and turquoise waters surrounding the islands. You can hike almost anywhere there like Diamond Head or the Needle mountain as it juts into the sky or take a helicopter tour. Visit the island where they filmed Jurassic Park or take the train to see the sugar cane fields. Drive up to the Haleakali Volcanic Site for a stark desolated landscape that looks dropped into the middle of these lush islands, or the Hawaiian Grand Canyon or drive around the perimeter of an island and see the different beaches (like the black lava beach), waterfalls and cliff sides and check out all of the scenery. They even have flowers growing out of old abandoned cars. Then the nightlife activities whether it's a luau, an elegant dinner or a show really round out an experience spent there. Hawaii should be on everybody's bucket list.